The newest addition to Zynga's game family is Hanging With Friends, an app for iGadgets big and small. It's a twist on classic hangman, with elements of Scrabble and other word games thrown in. You can only choose from a handful of letters when building your challenge (a la Scrabble), though you are given the whole alphabet to guess from when on the receiving end of a puzzle. You play as a helpless avatar, tethered to a handful of balloons above a strangely friendly-looking volcano. Each puzzle that you solve correctly keeps you firmly above said volcano, but, after each failed attempt, you sink closer and closer to danger. Once the game starts, you guess letters until you've either solved it or run out of strikes. Three elements that set the game off from just another hangman game are the Suspects, which shows you four letters, only one of which is in the puzzle, Extinguish, which eliminates four letters, and Revive which restores one of your lost strikes. The game is available as a free version for a limited time, before it's only available for $1.99. I recommend the free version, though it does feature ads. The trade-off is a fair one, however, considering the ads don't interrupt gameplay and are easy enough to dismiss. If there's one thing Zynga knows how to do, its reach a wide audience using social networks and Hanging with Friends is another example of this. You can send out challenges to individual friends using your contact list, Facebook, Twitter, or With Friends profile. If everyone is being particularly slow returning the serve, it's easy enough to challenge the entire Twitterverse at once, or else find another lonely soul just looking to—ahem—hang. When I searched for a random opponent, my call for help was answered in under a minute. If you are stuck somewhere without internet, starting up a local game is just as easy. According to the Zynga website, up to 20 different challenges can be stored at once, so feel free to challenge away! There is a basic filter that stops you from using gibberish words or proper nouns as challenges, though I don't think there's a filter banning inappropriate words. There is also no time limit on solving or creating puzzles, so nothing is to stop those dirty cheaters from using the internet to seriously stump you. Also, like Words with Friends there is a chat feature you can use to call those dirty cheaters out, or to swap tricks of the trade. The iTunes page already features comments about bugs in the game, but the only bug I've encountered is occasionally being bumped out of the app while a page is loading. After almost two hours solid of playing the game, this only happened twice, and I could log back into the game immediately without trouble. 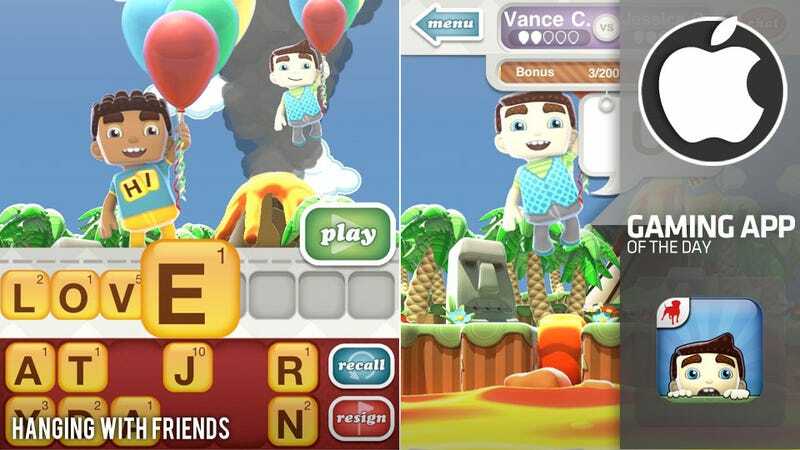 At the end of the day, Hanging with Friends is a cute addition to the Zynga collection. Unless you have absolutely no tolerance for ads, however, I would save my $1.99 and stick to the free version.